What happens when a crack opens between two parallel worlds? In this delightful, beautifully written fantasy by Jaclyn Moriarty, a girl named Madeleine, who lives in dreary Cambridge, starts writing letters to a boy named Elliot living in another world – the Kingdom of Cello. Their lives reflect each other’s across the gap. Madeleine is trying to fit into a new life without her dad, and Elliot is searching for the truth of the mystery surrounding his missing father. The whimsical tale includes not only creatures called Colors and an elusive Butterfly Child, but also relatable topics such as friendship, missing loved ones, and dealing with insecurity. The two teenagers help each other find where they truly belong in their respective worlds while guiding the readers through a richly constructed plot. Author Moriarty is a master at creating original quirky fantasy worlds while adding a good dose of reality. 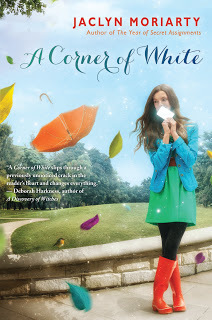 This book is a gem that I did not expect – I loved everything from her writing style to the tangible, irresistible secondary characters to capturing a teen’s emotions precisely on paper. The eccentric wordplay and biting wit will definitely keep readers entranced. Madeleine and Elliot’s stories remind me of Lewis Carrol’s “Alice in the Wonderland” with a similar childlike sense of curiosity and added practicality and humor. The pace is elating and the plot is spellbinding and enthralling. It leaves me contented yet on my toes, waiting for the next installment in the trilogy. This is the type of book I want to selfishly keep all to myself, but the better part of me insists that this is a must-read. Perhaps you’ll find a corner of white hidden in your own world.